I’m a pretty pro-bacon person: I make BLTs on the reg, and would never kick it out of any salad, sandwich, or pasta. Using the beloved cured meat slab as dessert, though, I may have an issue with: Candied bacon? What the hell is that about? It’s like putting bacon with ice cream and/or chocolate: Maybe some wonderful things just aren’t supposed to mix? I don’t have a rack, but this should give you the general idea. I had no trouble rousing people from sleep this morning, as the smell of candied bacon made for an amazing olfactory alarm clock. The bacon was chewy, slightly sticky, and straight-up delicious on its own. My son said it tasted like a bacon-wrapped date, without the annoyance of the “wrapping the date” part. But then I couldn’t help but think of millions of other possibilities for it. It would definitely take my BLTs to the next level. Or I could make a goat cheese, dried cranberry, candied bacon salad. Pancake sandwich with candied bacon in the middle. Some candied bacon crumbled and baked on top of a nice salted brownie. The possibilities are seemingly endless. The few moments it takes to sprinkle your bacon with brown sugar and pepper is well worth this singular taste sensation. 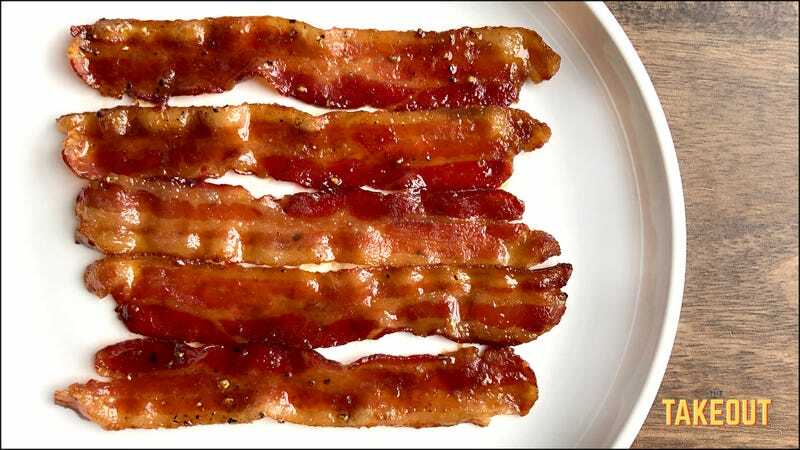 Lay out raw bacon on a rack over a cookie sheet. Top with brown sugar, smeared with a spoon. Sprinkle with fresh-ground black pepper, and some cayenne as well. Bake at 350 degrees for 20 minutes and enjoy.